The updated world generator will make more realistic environments with fewer oceans. Minecraft has been a work in progress for its entire existence. Even though it's reached and surpassed the official 1.0 release, new features regularly trickle into the jagged little land. In the current version, the many different terrain biomes are often placed awkwardly next to each other, with deserts randomly juxtaposed against arctic tundra. Meanwhile, massive oceans interrupt the typical brick-breaking gameplay and force players to either avoid them or slowly sail through. In a blog update, lead developer Jens Bergensten talked about how Mojang's planning on overhauling Minecraft's world generator to make the blocky landscape that much more interesting to explore. Jens mentioned three specific issues that he intends to address: oceans being too large, uneven biome placement, and lack of variation. To fix that, Mojang's overhauling the code that generates the maps. Future Minecraft worlds should have far less oceans, logical biome placement, and alternate configurations of those biomes for variety. 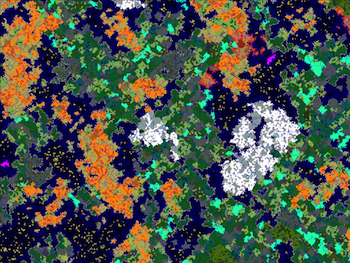 The picture to the right is the new 1.7 biome map. For comparison, this is the previous map. Small tweaks to Minecraft's world generation system can create noticeable borders between new and old terrain, so Mojang is overhauling all at once with the upcoming 1.7 update. Along with the new terrain maps, players can also expect new biomes, new rare and uncommon biome variations, and new flowers and trees to look at/harvest along the way.